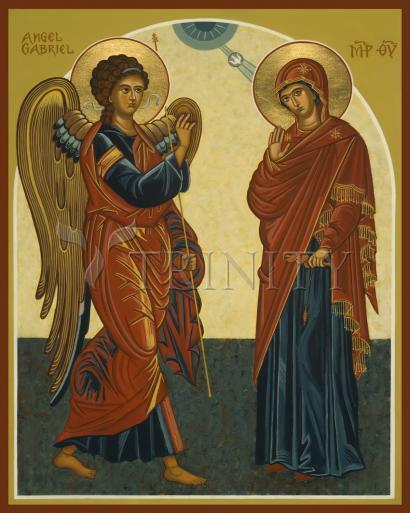 The feast of the Annunciation of the Lord celebrates Angel Gabriel's appearance to the Virgin Mary (Luke 1:26-38) and his announcement that she had been chosen to be the mother of the savior of the world. The feast of the Annunciation, now recognized as a solemnity, was first celebrated in the fourth or fifth century. Its central focus is the Incarnation: God has become one of us. From all eternity God had decided that the Second Person of the Blessed Trinity should become human. Now, as Luke 1:26-38 tells us, the decision is being realized. The God-Man embraces all humanity, indeed all creation, to bring it to God in one great act of love. Because human beings have rejected God, Jesus will accept a life of suffering and an agonizing death: “No one has greater love than this, to lay down one’s life for one’s friends” (John 15:13).